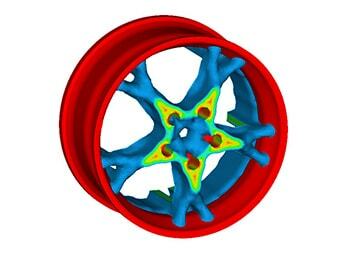 Practical NVH functionalities that enable engineers to develop better products, faster Automotive Noise and Vibration Analysis involves some of the largest and most complex models being used for Finite Element Analysis. Models regularly involve millions of finite elements, with thousands of components and properties, along with the connections between those components. 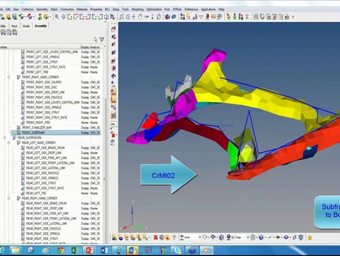 NVH Director employs Altair’s HyperWorks suite of computer-aided engineering (CAE) tools in a fully integrated, user-friendly, customizable form to automate the tasks involved in NVH analysis. By integrating the entire process of meshing, assembly, loadcase setup, and post-processing, it dramatically reduces the full-vehicle NVH simulation time, freeing CAE engineers to focus on optimizing product design and performance. 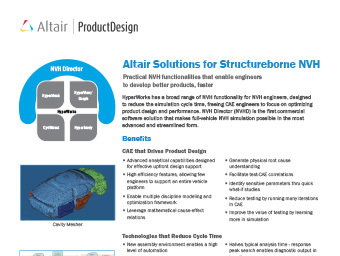 NVH Director employs Altair’s HyperWorks suite of computer-aided engineering (CAE) tools in a fully integrated, user-friendly, customizable form to automate the tasks involved in NVH analysis.